During our stay at the Elephant Nature Park, Alex and I signed up for a program called Journey to Freedom, which was initiated by Lek Chailert and remains affiliated with the Park. 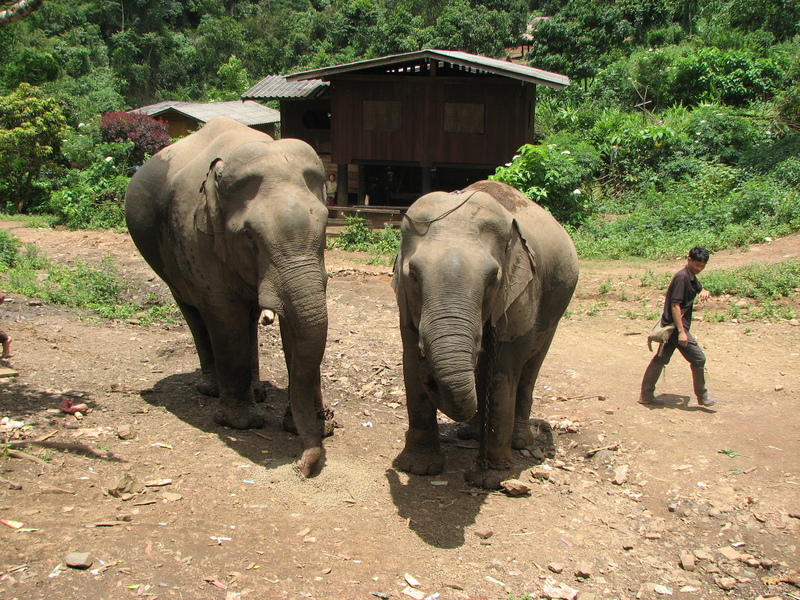 The program started in June 2010 with two elephants, Phu Gee and Mae Khum, and it’s aim was to transport elephants from trekking camps and elephant shows back to their original homes in the forests surrounding remote villages in Northern Thailand. 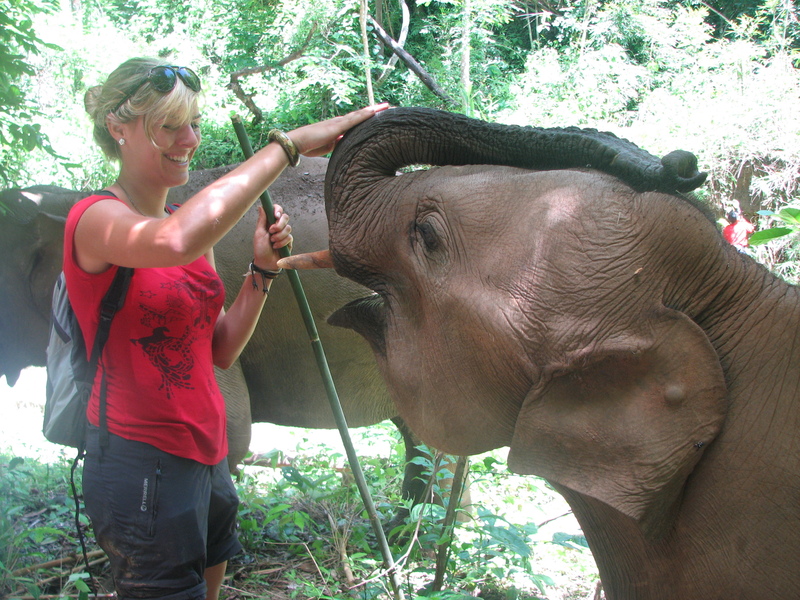 More information about the program can be found on the Elephant Nature Park’s website. 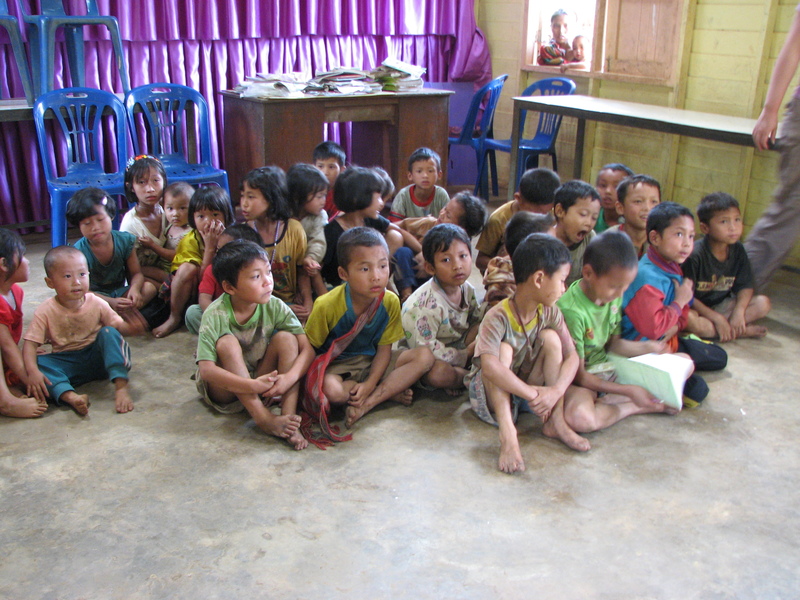 We drove eight hours up to the Karen tribe’s village that we would be staying in for the week. 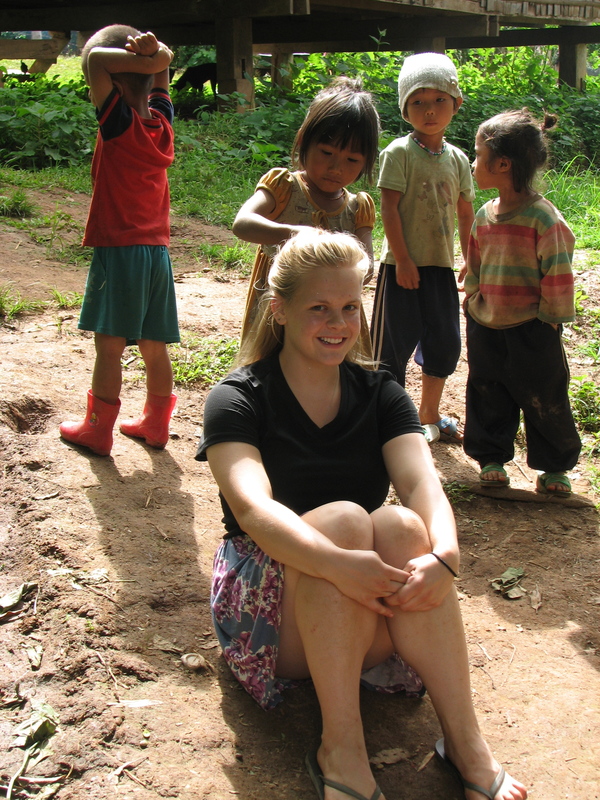 We weren’t sure what to expect upon arrival, and the description that we received regarding our trip was vague: we’d be staying in homes of the villagers and would be doing various volunteering projects, including planting rice and teaching English in the village school. Two vet students and the Park’s vet were supposed to accompany us as well in order to administer vaccinations and do general veterinary check-ups on the pigs, dogs, cats, elephants, buffalo and other domestic animals. During the first few days of our stay, the villagers seemed a little bit shy about interacting with us. There was a major language barrier; very few of them spoke English, or weren’t confident enough in their English skills to try to speak. Many of them spoke Karen instead of Thai, which made it difficult for our guide Dino to help translate for us. 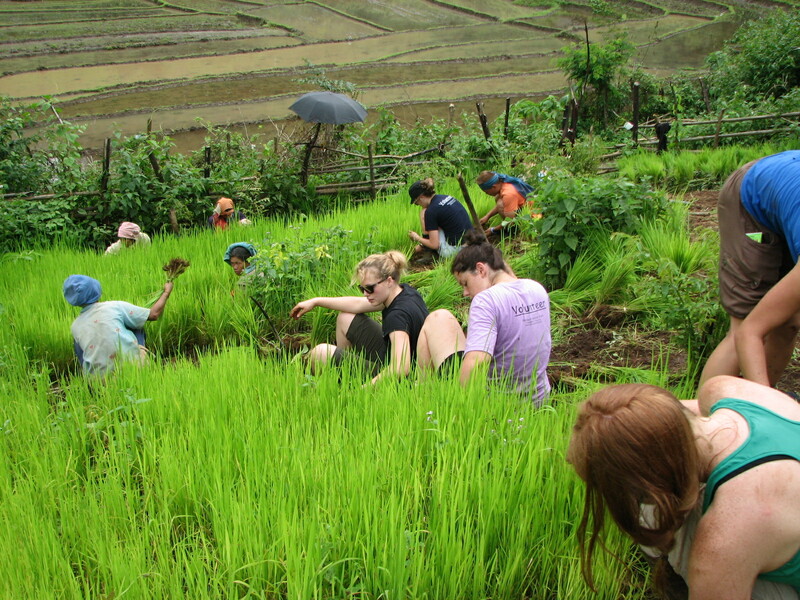 The next day we helped the women pick and plant rice, which was a surprisingly brutal experience. In the morning we helped pick the rice plants from the dry enclosure above the paddies, and after we took lunch with the women and their families we went into the paddies in the afternoon, where we transplanted the uprooted stalks of rice into soft, flooded rectangles of soil. We were impressed by the speed of the other planters, who were easily planting at least times faster than we were. After we finished helping with the rice, we made the long and ridiculously steep uphill walk back to our village. The homes we were staying in were rustic but comfortable, equipped with electricity, mattress pads, sleeping bags and mosquito netting. The evenings were the best time of day, and we mostly spent them playing with the adorable kids. We played Ring Around the Rosie and Duck Duck Goose with them, and then taught them “Head, Shoulders, Knees and Toes,” and they taught us how to count (badly) in Karen. The brightest child was Pradachinee, who mastered each game and word sequence and patiently translated our numbers into her language so that we had the opportunity to learn as much as she did. She basically ran circles around us linguistically, which is always a little bit embarrassing but did make it a little bit easier for us to talk with her and the other kids. 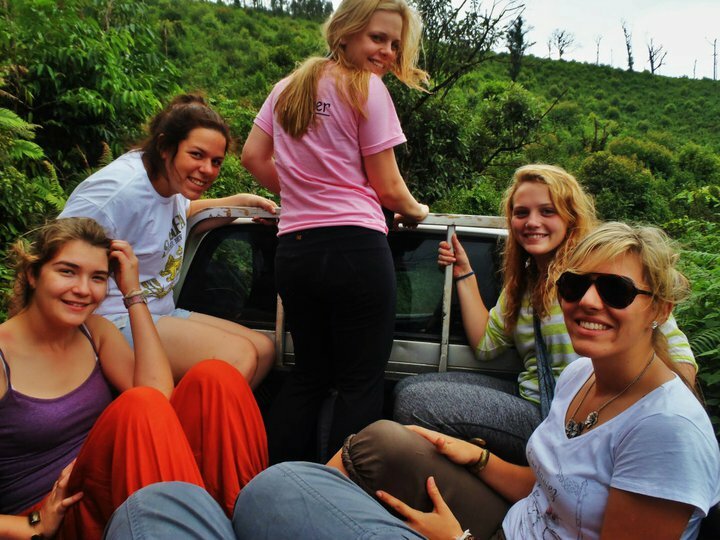 A good portion of the rest of our trip was spent observing elephants. There were two separate sets of elephants for us to visit; the first was a small family of three adult females, one flirtatious adolescent male, and a set of nine month old twins. The elephants were summoned from the forests around the village by their mahouts (caretakers), and we spent the day following them closely. It was a rare experience to get to see them in their natural habitat, and a treat to watch the family interact. Several times during the course of our hike with the elephants we stopped to give them bread treats, and more than once they came close to knocking us over in order to get to our tasty, milk-flavored carbs. 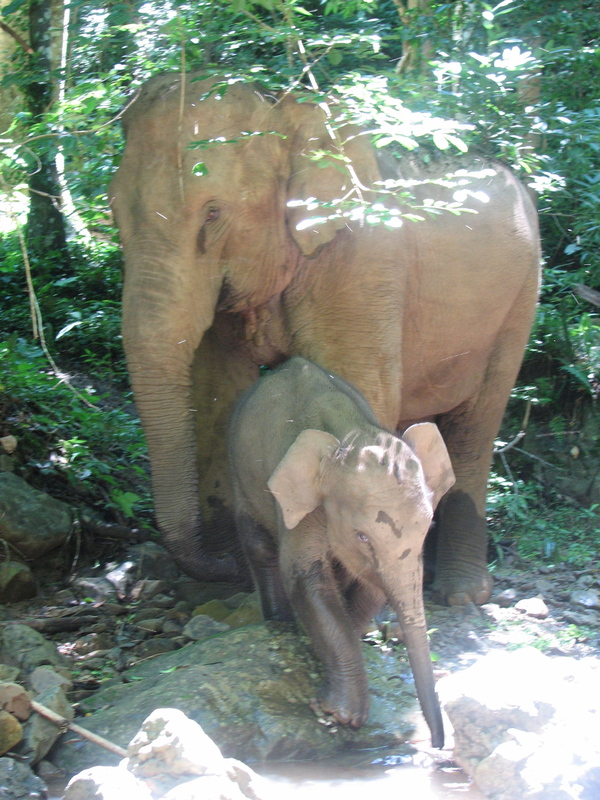 The other set of elephants that we got to see were the two original elephants in the program, Phu Gee and Mae Khum. 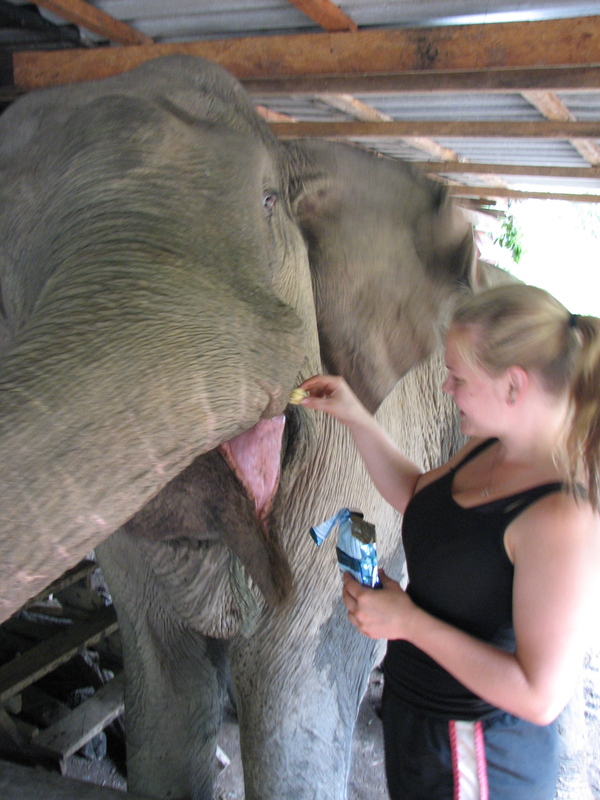 Phu Gee, a gigantic male, was incredibly docile and allowed us to feed him by placing food directly into his mouth. This gave us the unique opportunity to be slimed on by gross elephant tongue, but the big guy was so cute that none of us were really bothered by his drool. Mae Khum, however, was more reserved and a little bit cranky. Mae Kuhm, unfortunately, has something of a reputation, and has unfortunately been known to kill her babies and the babies of other females nearby. Phu Gee is her “boyfriend,” but also the father of several other elephants in the area, and Mae Khum has had to be separated from the other elephant families in order to avoid further tragedies in the community. On one of our last days, we went to teach English at the local school. Teach is a little bit of a loose term, and I’m not actually all that sure that anyone actually learned anything. In the morning we had people of all ages come to watch and learn, but everyone’s attention span seemed to taper off by mid-afternoon. We brought a big lunch of fried rice for the kids, and after we ate we played a game of soccer with many of the boys. They were much more talented than we were, however, and literally ran circles around us while we tried to keep up. Later that day we tried to regroup and actually teach English, but the kids soon got antsy. Alex and Lauren, another girl in our group, decided to make paper airplanes with the kids, but this turned into a game of “attack the teachers with paper airplanes,” which in turn became a game of “attack the teachers with anything at hand, namely rocks and fingernails.” Thankfully we were allowed to be done after things took a turn for the violent, and we went back to our base village exhausted. At the end of of our stay, we were able to watch the women weave scarves, bags and shirts in their homes. We were given the chance to buy some of their gorgeous goods, and we jumped at the opportunity. I bought shirt for 500 baht (about 15 USD) and two scarves at 250 baht a piece. Later that evening a special ceremony was conducted in our honor, and one of the village elders blessed each one of us in turn. We left the next morning sad but ready to return to the creature comforts of civilization, all of us sunburned and dehydrated but glad for the awesome experience. Thanks Jo! It took a while, but there was a lot to say about it. It was a really great experience and pretty unique as well. I really couldn’t have been happier with how things worked out, and I would highly recommend it! Thanks for reading! Wonderful story Natalie and so evocative, descriptive and well written. I’m pleased you had a good time not only with the elephants but with new ways of doing and being and I’m such natural settings too. Was lovely meeting you at ENP. Jo sent ms your blog by the way. Take care now. I am back in Sydney travelling between cattle on the farm and refugee humans not rlephants this time, in the city. One woman is Karen and from a border refugee camp. The MAHOUTS at ENP were also Karen. I hope this wonderful adventure gives you ongoing joy and smiling memories in your years ahead and that returning home is not too daunting. I found it very difficult settling in… But life continues and there are adventures to be had….Travel like this changes and transforms. Natalie, Can you tell me what month your visit was? I see some other groups picked corn but you guys helped with rice. When you say went into the paddies, do you mean wading? Did you see any snakes? I’m considering this trip with my teenage daughter and need to decide if she could cope. Thank you! I went there in July when I did rice picking but that was just for Journey to Freedom, not for the standard park visit. 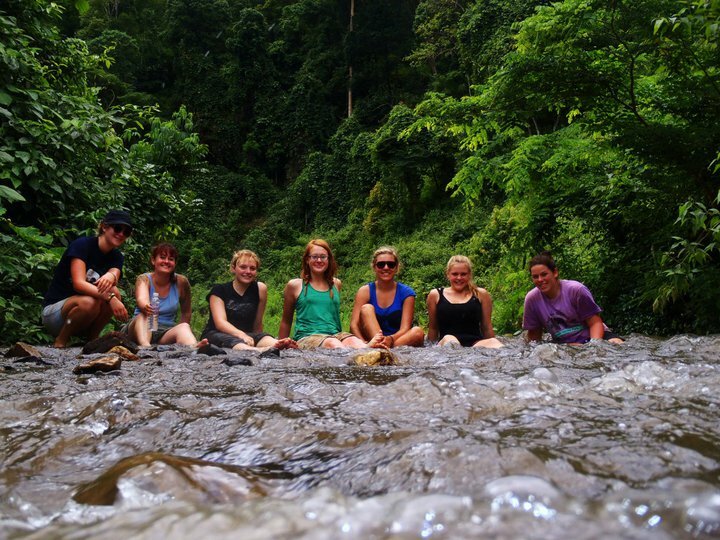 We did go wading in the rice paddies, they weren’t very deep and there were edges on the side that we could stand on. It was hot and sweaty but rewarding! We did not see any snakes, but I did have a big frog jump on my leg which was briefly terrifying but certainly not life threatening 🙂 Your daughter would probably have a great time!